Last week we discussed rotator cuff tears and impingement of the shoulder, this week we will discuss another painful, activity limiting condition called frozen shoulder. Frozen shoulder or ‘adhesive capsulitis’ is a painful disabling inflammatory condition that affects the shoulder joint. It is however very common but in many cases the cause is unknown. Some clinicians speculate it can start after doing some repetitive type work with the shoulder for example painting overhead. Essentially, the connective tissue or capsule enveloping the shoulder joint becomes inflamed as a protective mechanism to a sore tired shoulder which in turn leads to stiffness and reduced range of motion. 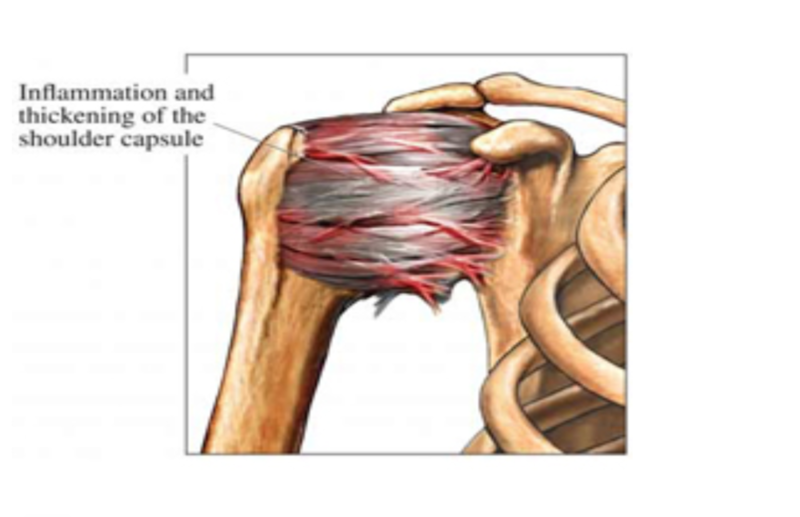 When scar tissue builds up in the capsule, this then thickens to protect the shoulder, so really it becomes a vicious circle where it keeps scaring and trying to heal, but the healing process is the thickening of the capsule in the joint meaning more and more stiffness. Many will notice the pain worsens in cold weather or at night. Unexpected movements and unexpected bumps can bring about intense cramping and pain. Most people will find they find it hard to get their hand behind there back or get their hand back to put on a coat. Frozen shoulder is often misdiagnosed as an arthritic joint and the symptoms are very similar (stiffness, loss of movement) but they are actually unrelated. Adhesive/frozen/stiffening phase: Pain starts to subside, progressive loss of glenohumeral motion in capsular pattern. Pain is apparent only at extremes of movement. This phase may occur at around 4 months and last till about 12 months. For anyone who may have the condition and is reading this, those time frames may seem shocking. Fortunately, and I stress, there is quite a lot that can be done to ease the process and help restore range of movement which in turn eases the pain. 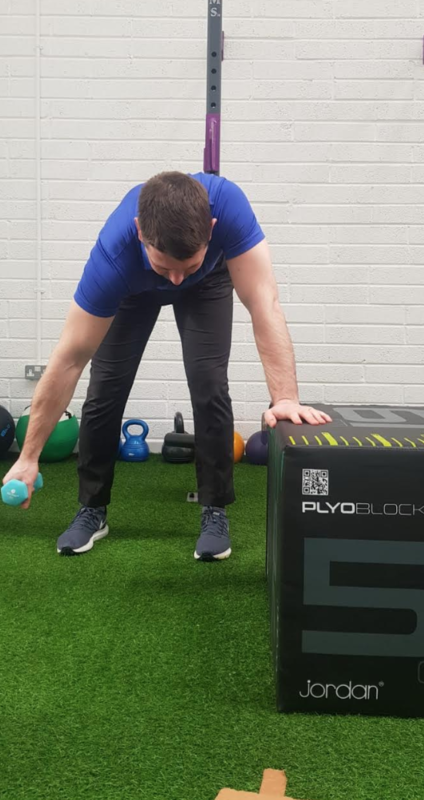 A combination of specific manual therapy which includes mobilisations with movement with specific exercises have been shown in the literature to be effective. These include ensuring the humeral head (arm bone) sits back into the socket of the joint (see exercise below). During frozen shoulder it is generally the front of the capsule that becomes thickened and tight and this shifts the humeral head forward. 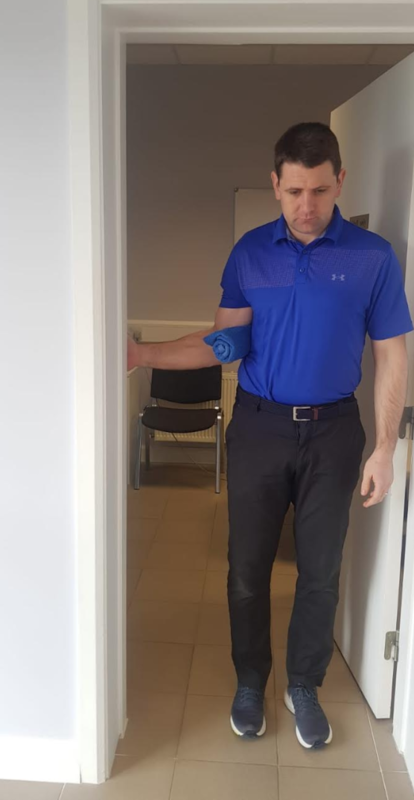 Also it is important that some hands on treatment work to the rotator cuff muscles is carried out as these muscles will often get sorer and tighter the longer the condition goes on, because they are not moving like they should due to the stiffness of the capsule. What has proven NOT to work effectively in the literature and research is getting a steroid injection, this may help with short term relief but in longer term follow up assessments and studies of individuals they end up no better off than those who go through the conservative route of physical therapy and exercise. So remember there is something you can do to help yourself and prevent the condition getting worse. Check out our TC physiotherapy social media pages for more info on this injury and try these exercises below. 3. Keep it moving ! Make 20 full circles and repeat 3 times. How to keep your shoulders Healthy?